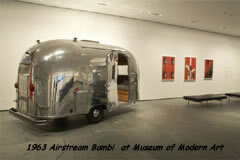 If you're going to be in the New York area this year, stop by the Museum of Modern Art at 11 West 53 Street and check out the 1963 Airstream Bambi that's on display in the museum lobby until November 12, 2007. The display of the vintage Airstream travel trailer is the museum's way of celebrating its recent aquisition of it as part of the museum's permanent collection. The distinctive shape and color of the Airstream has made it a cultural icon, making it a welcome addition to the museum's collection. The display also includes some travel and automobile posters from the museum's collection. If you really like the Bambi Airstream, you can become the owner of one. 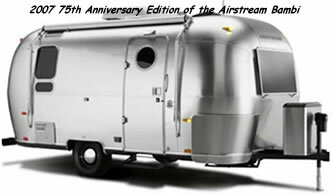 Airstream is manufacturing a 75th anniversary edition of the Bambi Airstream this year. The base MSRP starts at around $31,000.